The Eagle was the first gold coin issued by the US Mint. It also remains to be the largest gold coin ever issued under the Mint Act of 1792. Due to the fact that it had no denomination on it, and that the general public had no idea what to name the coins, it became known simply as the Eagle, due to the image of a glorious Eagle on the reverse side of these $10 gold coins. The $10 Eagle during its entire history from 1795 to 1933 went through several alterations, just like the rest of the Eagle gold coin variety. The 1795 to 1797 issue for instance, first designed by Robert Scot, featured a Capped Bust Right obverse, with the small Eagle on the reverse side.The reverse design was changed however, to portray the Great Seal of the United States, termed the Heraldic Eagle by coin collectors. 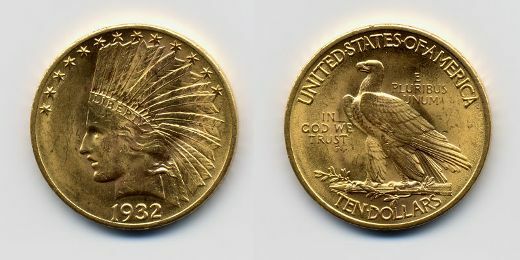 The pure gold content of the $10 Eagle however remained at 17.5 grams and .9167 fine gold. The depiction of the Heraldic Eagle on the reverse design started in 1797 and lasted through 1804. Due to the many changes pertaining to the number of stars on the obverse of the early Eagle coins, Mint Director Boudinot in 1797 made a decision to cease the addition of new stars to the coin designs whenever a new state joined the union. Only 13 stars were portrayed on the $10 Eagle from that point on.During the year 1804, coinage of this denomination was halted upon the order of President Thomas Jefferson, because the $10 Eagle was said to contain more gold than their face value. They were being hoarded, melted or exported and they were not being put into circulation as they were supposed to be a mode of currency. However, by 1838 the Eagles resurfaced after a 34 year hiatus; the gold coin was needed once more. During that year, legislation was passed by Congress ordering the weight of US gold coins to be lighter, making the coins’ metal content correspond with their legal tender face value. The alarm over mass gold coin exports finally ended, and Eagle production began anew. The Coronet depiction of Lady Liberty on the obverse was introduced during that year, as designed by assistant Engraver to William Kneass, Christian Gobrecht. A motto, “In God We Trust” was added in 1866 due to strong appeals made by Rev. M.R. Watkinson of Ridleyville, Pennsylvania. Watkinson proposed the recognition of the country’s faith in God, and then Treasury Secretary Salmon P. Chase, being a religious man, agreed with the idea. On March 3, 1865, an act mandating the inscribing on the motto on all existing silver and gold coins for minting in the US was made. The $10 Eagle coin is indeed an heirloom-quality piece that features a wondrous work of art. To add it in one’s collection would surely make any coin collector proud.